The Whiteside family has been traced back to the 16th century and Robert Quyteside of Peel House, in the area around Marton, between Lytham and Blackpool, but the research on this line, connected with Armour and Lupton families in the late 19th century, has so many unanswered questions and dubious sources that the early history is not included here until further extensive checks have been made, especially on Whiteside wills. Unfortunately the idea has been widely promulgated that the 'original' name was 'Quyteside'. No, the answer is much simpler. Early records were in Latin, a language that has no 'W' so this was used by the church in recording names. (The attempt later to do this with Lancashire place-names led to some very odd inventions!). Nor is it particularly Scottish since it has two good old Anglo-Saxon words 'white' and 'side' added together, so it would have the been a description of many places throughout the whole country, not a particular 'place-name' just a dwelling which could be recognised by a white cliff or other landmark nearby. The only 'relationship' between the original holders of the name is that they lived in a similar place, not much more distinctive than Wood or Field! One particular difficulty with the surname is that it is very common and widespread throughout Lancashire. The problems are further compounded by the repetition of the same first names and also similar naming patterns among members of the same, prolific, families! Sometimes it is also difficult to draw a line between Thurnham and Lancaster as there was considerable intermarriage and movement between the two congregations. People from places as far away as Dolphinhome, Wyersdale, Scorton and Garstang were also frequently buried at Thurnham. This present account begins in the 18th century and the start of Catholic records in Lytham and Westby and then follows two families contemporary with each other. New information obtained from a will by William Whiteside, brewer, of Lancaster, husband of Catherine and father of Thomas, Margaret, John, Richard, James and William suggests a different solution than shown here previously to the origins of Thomas Whiteside, at present the oldest certain 'father of the family' who was buried at Thurnham in 1833. There are two 'contenders' for the parents of Thomas Whiteside, both originating in the Fylde in the mid 18th century. The first proposed here, that of John Whiteside and Margaret Bickerstaff in Lytham is now looking very doubtful. New information makes it very likely that Thomas can be identified with the 'Thomas Whiteside of Thurnham...husbandman', nephew of William Whiteside of Lancaster, brewer who died on 31 Dec 1827 in Lancaster. Thomas of Thurnham was one of the two executors of his will (see the complete transcript) and would have been a beneficiary if none of William's children had survived. All William's children are named and the survivors are easily identified in various censuses, two being benefactors of St Peter's chapel, now the Catholic Cathedral. William was buried there in 1825 in the Whiteside Chantry. It still remains a mystery about Thomas's parents. His uncle William was almost certainly the youngest child of John Whiteside and Alice Gillow, assuming that marriage to be correct (and the subject of research still), Alice being sister of Robert Gillow, founder of the famous furniture firm. 1. Henry could perhaps be identified with the Henry who served an apprenticeship with the firm of Gillows and became a partner when the firm became Redmayne, Whiteside and Ferguson about 1811-1814. Henry Whiteside and his wife Jane had one daughter, Margaret born in London who married her cousin James Whiteside, son of William (see below) (The firm had opened a branch in London) That assumes another child here, an Edward, but perhaps there are other 'candidates' among his cousins? 5. William probably married Catherine Smith 13 Jun 1791 in the Catholic chapel at Salmesbury. No other record has been found and this 'fits'. However, the only baptism of a possible Thomas in Lancaster - who we know to have definitely been his son, subject of a stern parental rebuke in William's will and cut off with only five shillings - is that of a Thomas son of William and Alice baptised on 26 Oct 1790. It could be that Alice died leaving William in urgent need of a new mother for Thomas. It is obvious, again from his will, that at least some of his children were 'under age', i.e. not 21 in 1813 when he wrote it, but in fact the ages are known from the Catholic records - a common practice was to baptise the baby the day it was born or, if at night presumably, the next day and there seems no reason to assume much delay in this case, so only the first two would be 'of age'. Children of William Whiteside and Catherine: (sps=sponsores, i.e. godparents), all born in Lancaster and baptised at the Catholic chapel. Who was Thomas Whiteside of Thurnham? Before extending this family history back several more generations the following is offered for discussion! Your views are welcome especially if you can throw any light on the problems! Was there another Thomas Whiteside in Thurnham, a 'rival'? None has been discovered. Although Thomas did not live long enough to appear on a census he is there in the Catholic records with no other of that name and is noted by Joseph Gillow, historian, as grt-grandfather of the Archbishop. There were others further away in the 'parish' of Cockerham though none of the right age and not Catholics. He was given as aged 64 when he died in 1833, which means he was born in 1769 - but his wife had died in 1830 so who knew and could they have been wrong? According to a footnote in the Lancaster records by Joseph Gillow, a John Whiteside drowned in the canal at Dolphinlee, a farm and settlement near Lancaster, on 28 Jan 1811, aged 68 and an unidentified Catherine Whiteside, described as a 'paralytic', died at Dolphinlee on 12 Jan 1814. Family stories circulating in several branches of the family include the detail that the death of a grandchild who fell in the canal preyed on John's mind as he blamed himself for the incident. It was claimed by some that the John from Lytham was the one named, though there is some confusion surrounding the name itself, identifying a James as the family ancestor and John as his brother. No James has yet been found to 'fit' this theory unless there were brothers, James and John, at Marton Moss - not positively identified by anyone yet - so the drowning incident could refer to either John the husband of Margaret, from Lytham, or John the husband of Catherine, from Westby. No inquest or newspaper report of the drowning has been found. Before the Westby record begins! ___The Shepherd family could be related to the family from Salwick who were Lupton ancestors via the Hull family on the paternal side. The name also appears as a middle name among the Hayes grandchildren of Thomas Whiteside and Elizabeth Cottam (next family below) The name 'Hayes or Hayse was sometimes entered as Kaye - whether a misreading, mishearing or other mistake is not clear, but there do not appear to have been two separate families. ________It is not known what became of John and Margaret Whiteside who had no more than six surviving children, (only one William and one James), perhaps fewer. The Return of Papists is sometimes almost as good or even better than a census, but it doesn't include everyone. It is quite possible that these two families were related but earlier records would be somewhat buried under hundreds of Whiteside names in C of E parishes! Whether they also had a Catholic marriage ceremony is not known but Catholics had by law to marry in the parish church at that time. 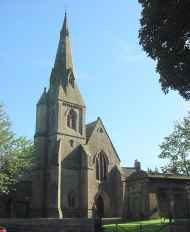 Their eldest child, Margaret, was born in Clifton, (near Preston) and was baptised at the domestic chapel which preceded the mission at Salwick and Lea on 29 Jun 1791. 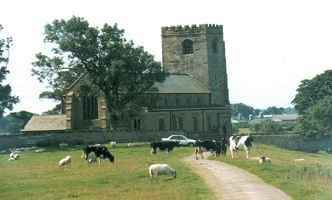 They then moved about 1792 to Ashton in the parish of Cockerham, on the coast between Glasson and Lancaster where Thomas became a farmer. The rest of their nine children would have been baptised at the Catholic chapel in Thurnham Hall, not the church! In the Thurnham chapel records the parents are given as Thomas and Elizabeth, with Thomas described in order as labourer, then husbandman, then farmer. This is important as it identifies him rather more securely as the nephew of William Whiteside, brewer of Lancaster in his will. Margaret's parents' names and her godmother's name strongly suggest that she was indeed the eldest of this family. One interesting name which occurs in the next generation is that Catherine and her husband Richard called one of their children, born 15 Jan 1822, Robert Shepherd Hayes. A Shepherd connection appears in the family of John Whiteside and Catherine above. A footnote by Joseph Gillow gives the details of Mary Margaret, saying she was 'known as Margaret'. This is almost certainly correct - and she is listed only as Margaret, not only in the marriage entry but on the 1881 census as well, which means the elder Margaret must have died. It was common practice among Catholics well into the 20th century to add 'Mary' as a first or second name in honour of Christ's mother sometimes several times over for their daughters. (Even boys in Spain received the name, as in 'Jose Maria'!) If they also had another name they were naturally called by that, so 'Mary Margaret' would always be called 'Margaret'. Henry Verity, 7th of 8 children of Thomas Verity and Elizabeth Cox, was born in 1806. He and Mary Margaret Whiteside were married on 15 Oct 1832 in the chapel which preceded St Peter's, now Lancaster Cathedral, and had five children as far as is known, Thomas (1837), Elizabeth (1838), Henry (1841), Mary (1843), and Helen (1846). Thomas, the eldest, married Mary Ball of Heaton, Lancaster, daughter of William Ball and Margaret Abram and therefore granddaughter of John Ball and Jane Cornthwaite. (See that family, where there is also more about these Veritys). There was an unknown but intriguing Mary Whiteside born about 1810 who married a sea captain, Robert Dowthwaite. They had a daughter Elizabeth born on 23 Oct 1832 in Glasson and baptised two days later at Thurnham. It is not known if they had any connection to Thomas's family, but it does seem highly likely. Elizabeth's godparents were John Whiteside (Thomas Gardner standing proxy) and Barbara Whiteside! Mary is listed on the 1851 census at Thurnham (as Mary Dowthwaite). She died in Lancaster in the Dec Q 1866 and her husband died there about a year later. John was born in Ashton on 10 Aug, 1795, as recorded in the Thurnham baptismal records, which unusually only record birth dates, not baptismal dates, his father, Thomas, being listed as a 'husbandman'. John began work as a 'labourer' in Ashton before 1825 . In 1828 he is recorded as a maltster, in 1830 as a clerk, in 1832 as a journeyman maltster and a maltster at Conder Green (between Ashton and Glasson) in 1834 and 1847, but by 1847 he had moved to Damside in Lancaster where he had a warehouse. 5. William Whiteside b. 31 Jul 1834 in Ashton, chr. 2 Aug 1834, sps Thomas Gardner, Elizabeth Lupton, proxies for James Whiteside and Margaret Wilson, d. Aug 1842, in Lancaster, bur. Thurham. All the children were born in Ashton, across the R. Conder from Glasson, and were all baptised at St Thomas's Catholic church, Thurnham, the details being recorded in the Thurnham records. Those up to 1837 have been published by the CRS but the records of the last two can only be obtained from the originals in the Lancs Record Office. John lived at 1 Ann St, where he was recorded as a communicant of St Peter's in 1845, but then moved to 2 Adlcliffe St, probably after Barbara's death in 1846. He died on 9 May 1847 and was buried at Thurnham. The Whitesides seem to have bought their own corner of the graveyard for John was buried in Plot 99 and William and George were buried in Plot 100. Another child, James Whiteside, who died on 5 Mar 1846 aged 10 months is also buried there in Plot 225. [Perhaps he was a grandson - not all decendants have been traced, but many of the family retained an affection for Thurnham and were buried there] Barbara [formerly Shaw Taylor] who died on 13 Aug 1846 was buried in Plot 235 three days later. She had been ill for some months with a diseased liver. John died, apparently in Lancaster the following year on 9 May 1847, having had bronchitis for three weeks, and was buried at Thurnham on 11th May in Plot 256. John Whiteside was described firstly as a ship's carpenter and then as a shipwright. 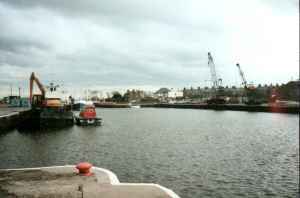 A new dock had been built at Glasson, the principle trade being in coal, but there were also boatyards where for a time there was plenty of work. 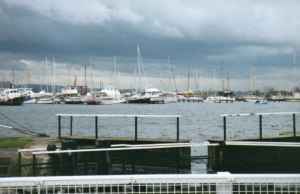 The dockyard (left) is still in use although a large part (right) is now a popular marina. 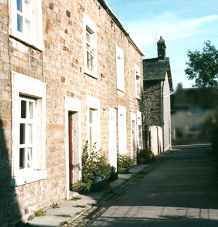 Several of the Whiteside sons of this generation brought up their families, some of them large, in 'two up two down' houses in the four or five streets in Glasson, one of which is shown here, conveniently just a few minutes walk from the dock. Richard, the 2nd son, a 'ship ... smith' and his wife Jane (from Sunderland, Lancs, surname unknown) were living 'just round the corner' with 2 children still at home, James (1859) and Mary (1864), so there were probably more who had left already. John, a ship carpenter, and Ann had moved with the first three of their seven children to Fleetwood a year or two before. They also had previously lived in a similar house here. Edward Hayes was perhaps related. John's aunt Catherine Whiteside (see previous generation) married Richard Kaye (or Hayes or Hayse). Both spellings are used in the Thurnham records at different times. Whether this was common or was actually a mistake then or in transcription is not known but does make it rather confusing!. They had 4 known children, Elizabeth (1819), John (1820), Robert Shepherd Kaye (1822) and Dorothy (1823). The first three were given as Ashton and Dorothy as Ellel, which a little further south, but all were baptised at Thurnham. Possibly the Kaye family didn't move but lived on the border between the two areas. 5. Catherine Whiteside 1877-1964 m. James Armour 3, the boat-builder. They had 14 children. John and Ann moved with their first four (surviving) children to Fleetwood about 1880. For a ship carpenter there was no shortage of work there, a new town in 1840 but by the 80s becoming a major port for deep sea fishing. From a newspaper obituary for John we now know that in fact he worked for James Armour, though not for how long. 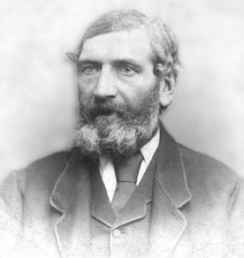 At the age of 60 when he died in 1902 he had been working as a ticket collector on the Fleetwood and Knott End ferry. By 1881 Ann's mother Alice Myerscough (formerly Bramwell) was living with them in Fleetwood, now aged 77, while her husband James Myerscough, 79, was living with another daughter and son-in-law in Pilling, on the other side of the R.Wyre, not the most convenient arrangement for old people to visit each other very often! Alice and her husband James were unable to afford a house themselves so this was a sad necessity, living space being a problem with the large younger families..John and Ann's eldest daughter, also Alice, was no longer living at home but at the age of 15 was working in Fleetwood as a 'general domestic' for Mary Ann Cowell, a master mariner's wife who ran a boarding house. (Her husband was presumably away at sea for long periods). 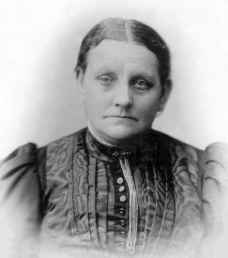 Alice Whiteside later became matron at Lancaster Royal Infirmary. removed here to save confusion as it looks less likely than previously!